With AMD’s new generation of CPUs still in the pipeline, all eyes in the enthusiast community are on Intel. Their newest generation of CPUs, codenamed Sandy Bridge, promise unparalleled performance. 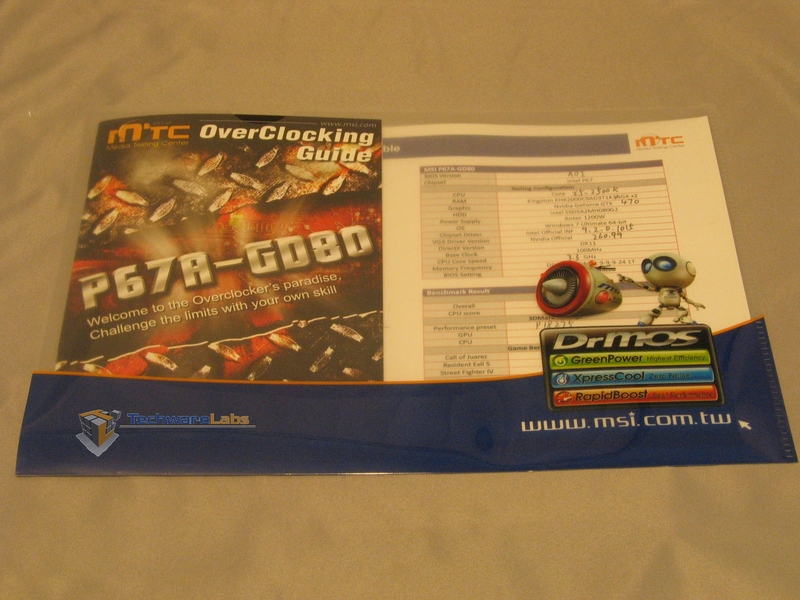 Of course, an awesome CPU needs an equally awesome motherboard to go with it. Enter MSI. They’re determined to take the lead with this generation of CPUs, and toward that end they’ve sent us their flagship P67 board, the P67A-GD80. Make no mistake, this board is aimed squarely at the performance-hungry. With features like automatic overclocking, premium solid-state capacitors and enough I/O ports to choke a horse, this board is poised to take the market by storm. MSI’s swinging for the bleachers here, let’s see if they hit a Grand Slam or a foul ball. 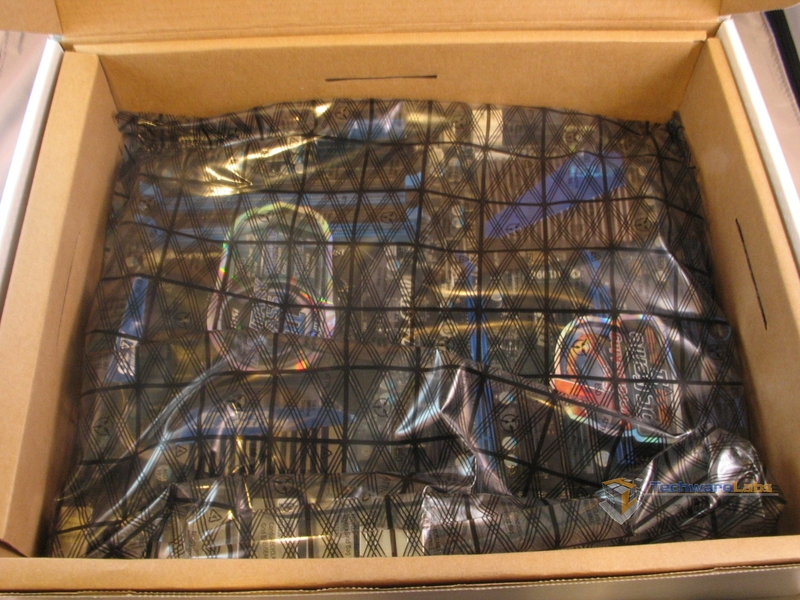 MSI wants to be sure they have your attention from the moment you lay eyes on the box. 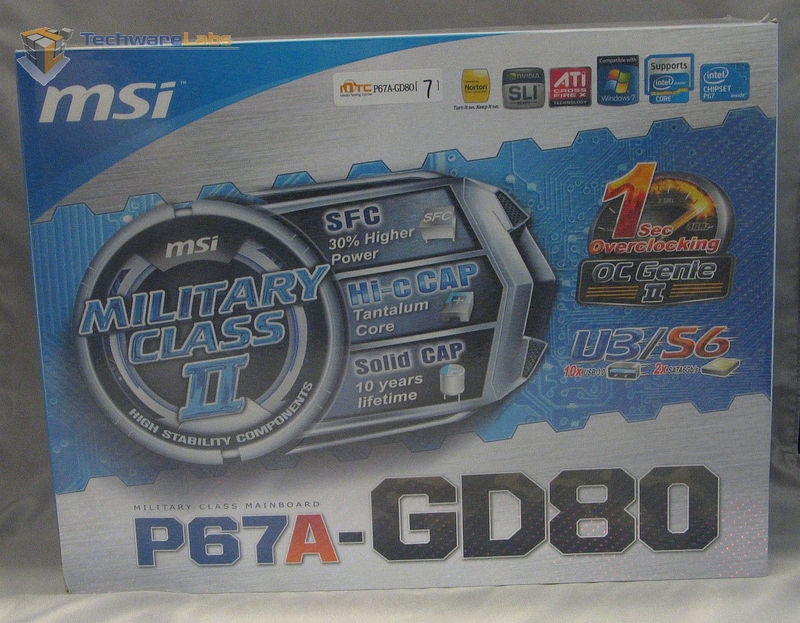 While the “Military Class” label is pure marketing fluff, the rest is pretty informative: Solid state capacitors, USB 3.0 and SATA 6GB/s, and rapid overclocking. 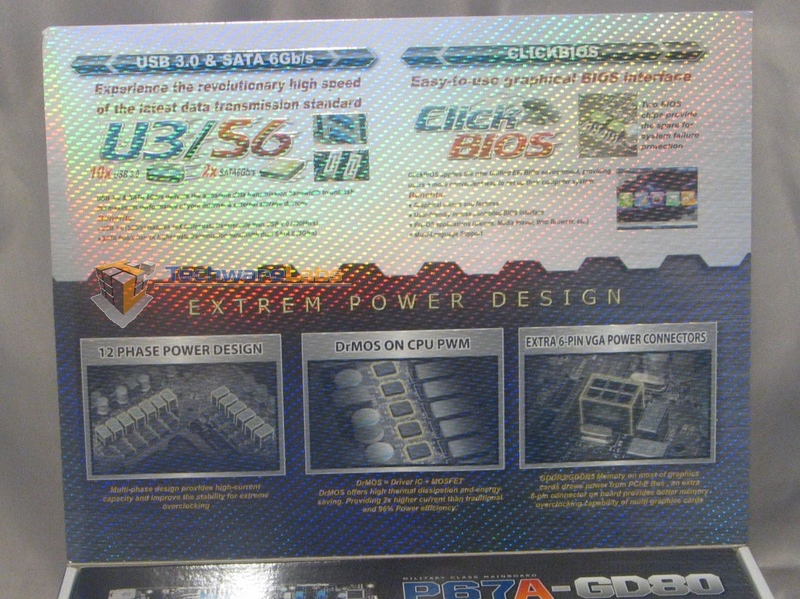 On the back, they get into a bit more detail, and also point out the board’s three PCIe x16 slots. Opening up the lid on the front, we see yet more information. The top of the lid gives us blurbs on the USB 3 and SATA 6.0 buses, the UEFI BIOS, and some of the power-related features. Also apparent here is the rainbow holographic weave stuck over every inch of the box. This thing couldn’t be flashier unless it had LED’s and a screen embedded in the box. 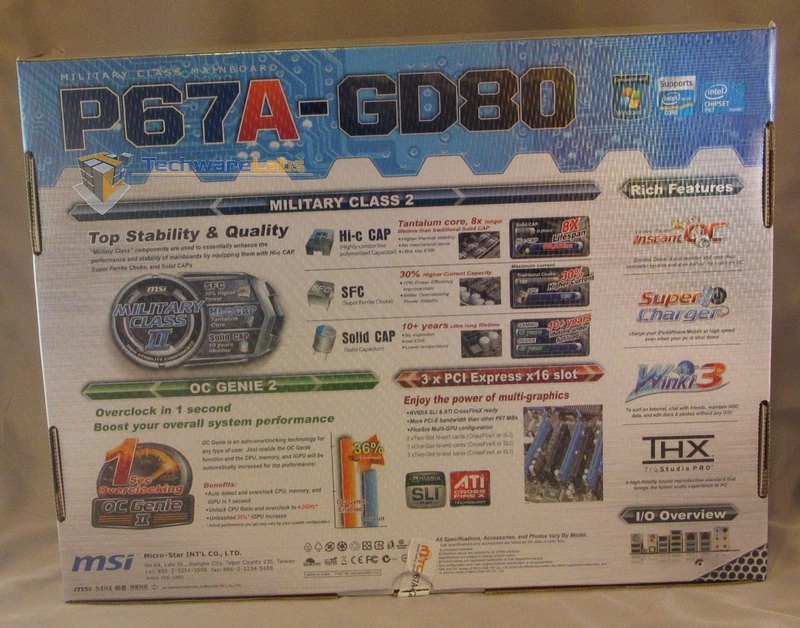 On the bottom half of the inside fold, they give us a overview shot of the board itself, as well as a sort of summary of all the features advertised elsewhere on the box. 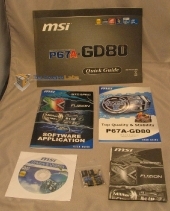 Kudos to MSI for providing as much info as possible on the box itself, but the rainbow coating made it hard to discern details in many kinds of lighting. 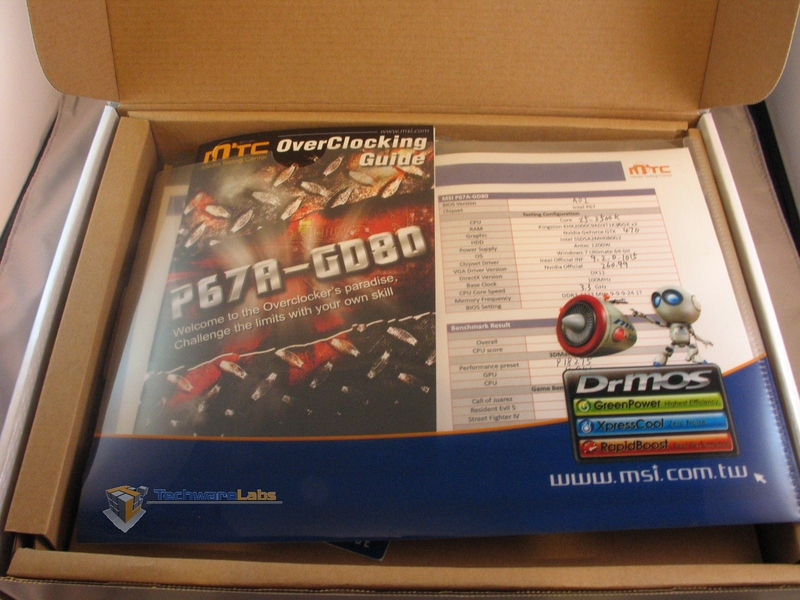 Opening the box up, the first thing that greets us is a folder containing an overclocking guide and a performance testing report. Clearly, MSI is marketing this board at the power-hungry enthusiast. Pulling all the accessories out, we see the board itself firmly wedged into a cardboard spacer, with an anti-static bag to keep it safe. Clearly, there is no lack of documentation here. 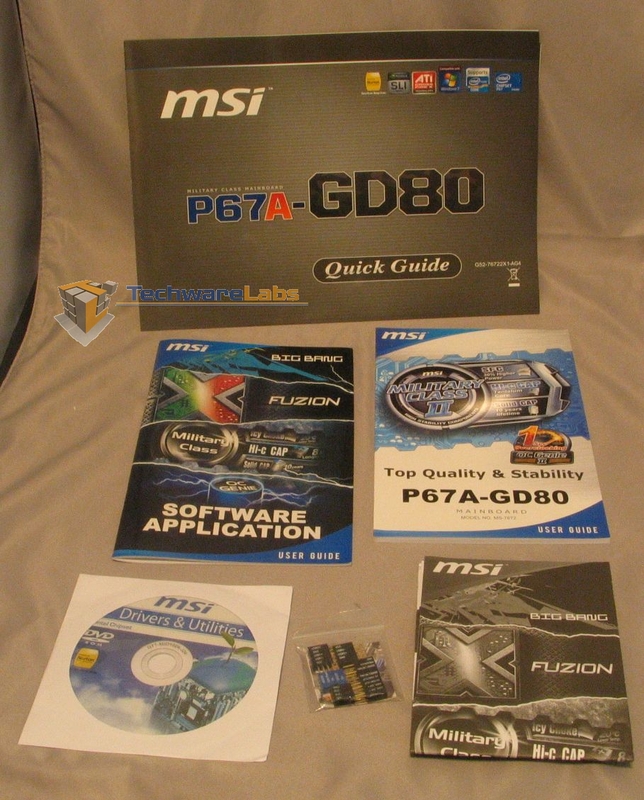 Aside from the usual driver DVD and user manual, MSI has included a quick-start guide, a full-color board diagram, and a separate manual for the software bundled on the DVD. Also tucked into a bag is a set of quick-remove header plugs for the front panel headers–always welcome in cases where clearance near the bottom of the board is tight. 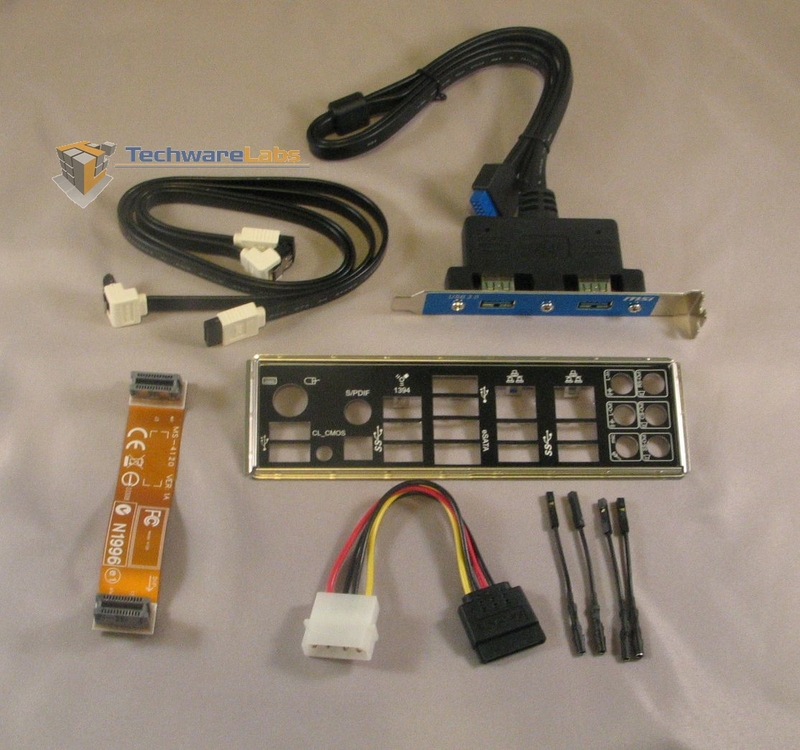 Pulling open the other accessory bags, we find a back-panel adapter for one of the USB 3 headers, two SATA data cables with right-angle plugs, a SLI bridge, the IO panel shield, a Molex to SATA power adapter, and four short wires for use with the board’s voltage check-points. More on this later. 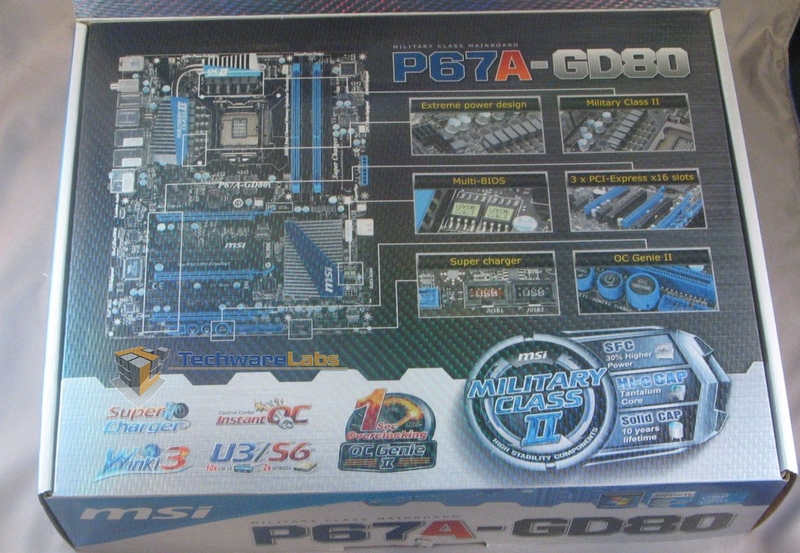 Here’s something that most manufacturers don’t include: a full-color diagram of the motherboard’s layout. 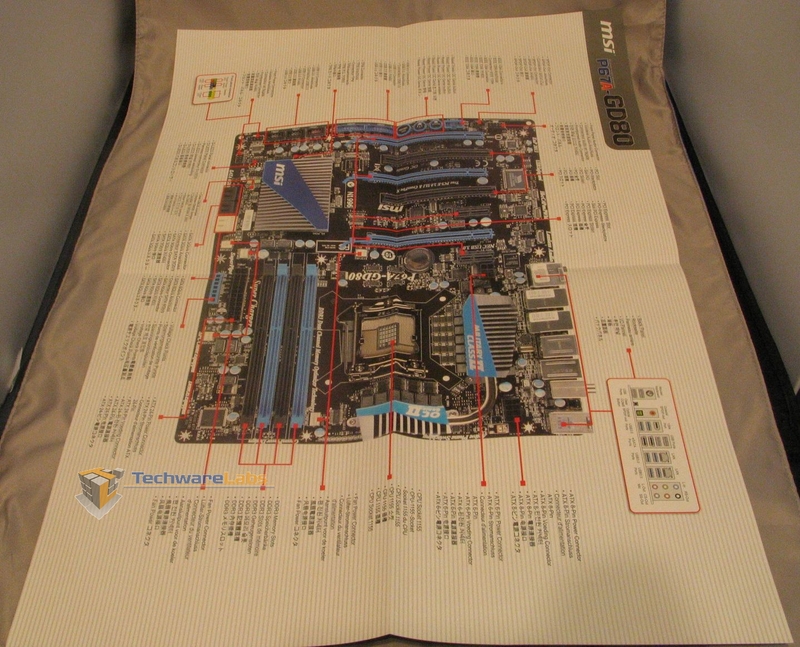 This sheet is large, larger than the motherboard itself, and so comprehensive that I didn’t once have to refer to the manual during hardware installation. It certainly wasn’t necessary for MSI to include this, but I’m glad they did. 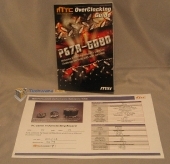 Last but not least on the documentation list is the overclocking reference material. 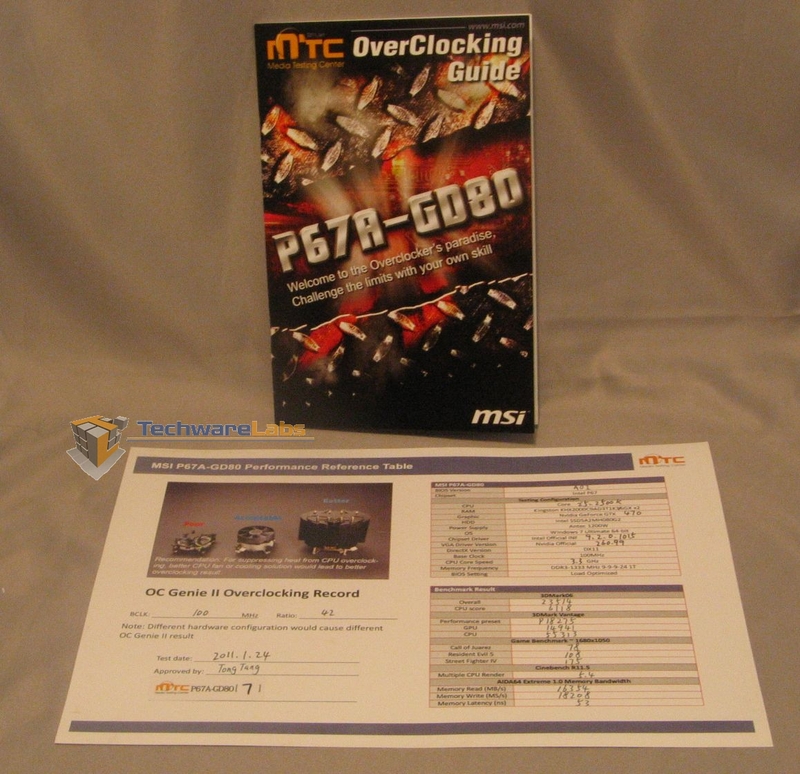 The overclocking manual is helpful for those just getting into the speed-boosting game, and the performance report sheet not only gives you some idea of what to expect with this particular board, but also lets you know that each board is hand-tested before it leaves the factory–always a plus!